I am pleased to announce that the Session has approved a new mission project, under study for the past year, of helping to provide clean and safe water to the children and people of Zambia and surrounding countries. This exciting news will enable all of us to join together in Christ's name to proclaim the gospel and minister in a very practical life giving way to those most in need in our world. 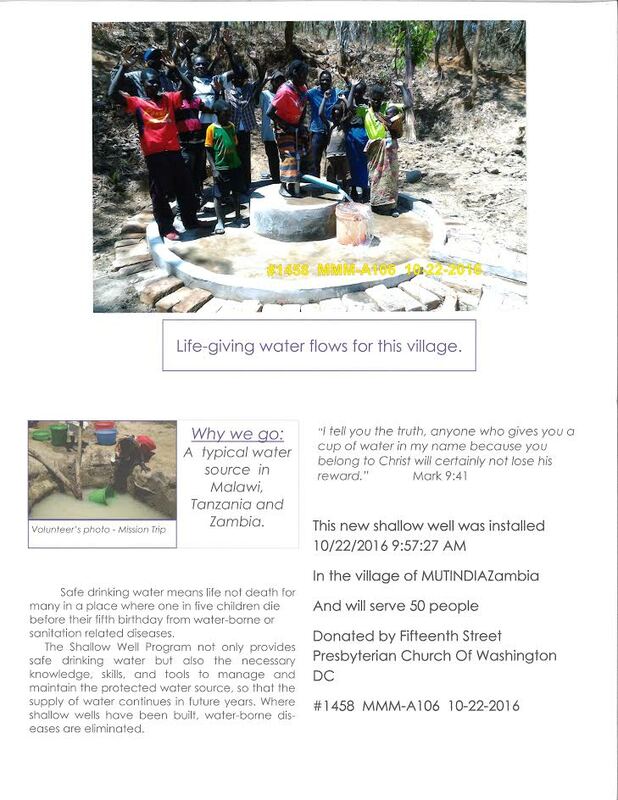 We will be joining together with experts in the field, Marion Medical Mission (a Presbyterian related organization) who for thirty years has been building wells throughout Western Africa. The need is immense and difficult to even imagine. In Zambia 60% live below the poverty line, 42% in extreme poverty. One child out of every 13 dies before their fifth birthday. Only 28% have access to electricity. 36% are without access to clean water. 50% are without access to sanitation. Marion Medical Mission uses a "partnership and local ownership" approach, building shallow, hand-dug wells because it creates ownership of the well. The villagers are responsible for digging the well and providing the materials they can, such as the brick, sand and stone. 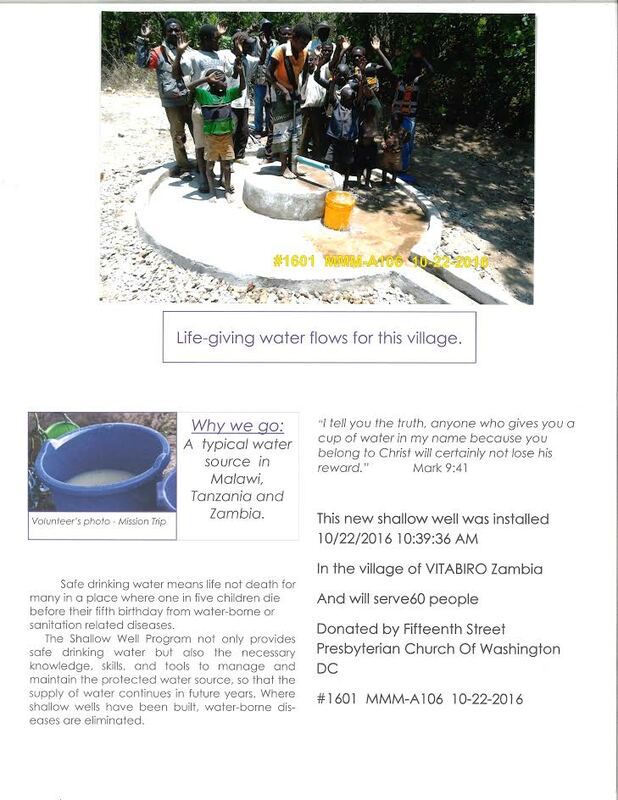 Marion Medical Mission then provides the cement, tools and skilled labor needed to complete the well. They put many hours of work into their well and are proud to call it their own. Since the wells are built by the villagers with Marion consultation, they are very familiar with the well. Trained local maintenance men repair the well in their community if it becomes broken. The villagers are able to get spare parts and maintain their well. Larger more complicated bore holes are much more expensive to repair and many well intentioned projects are now inoperable throughout the continent. Marion has a 90% current operational rate for all wells built over the last thirty years. As sponsors and friends, we will be able to receive information and correspond with these new well communities, as we learn from one another and grow in friendship and understanding. 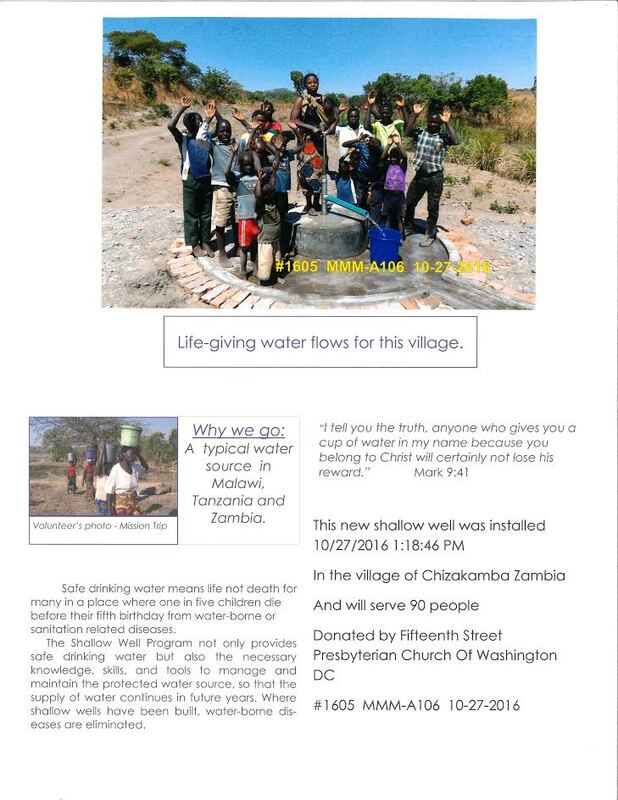 The cost of each well is $400 and we have set an ambitious goal of building 10 wells! 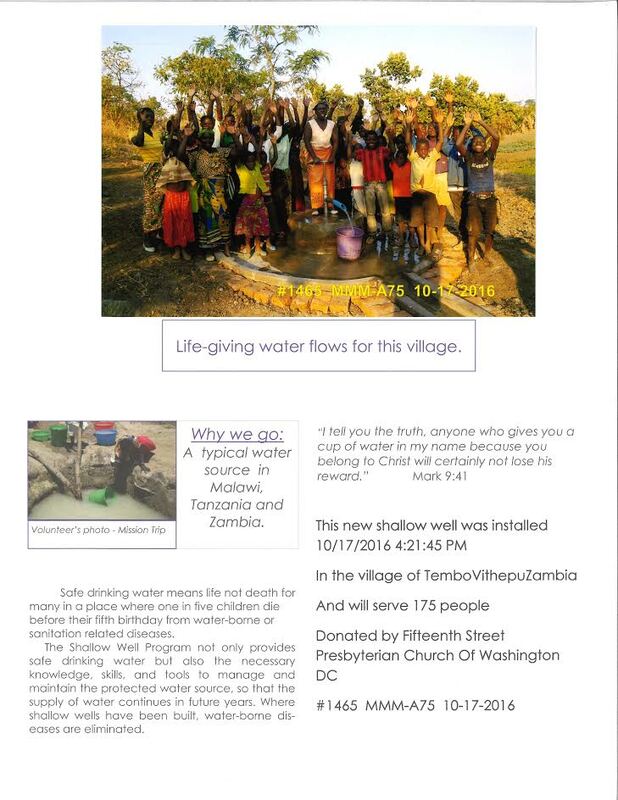 The Session has allocated from current mission funds for the first well and we invite you to prayerfully consider how you would like to help. 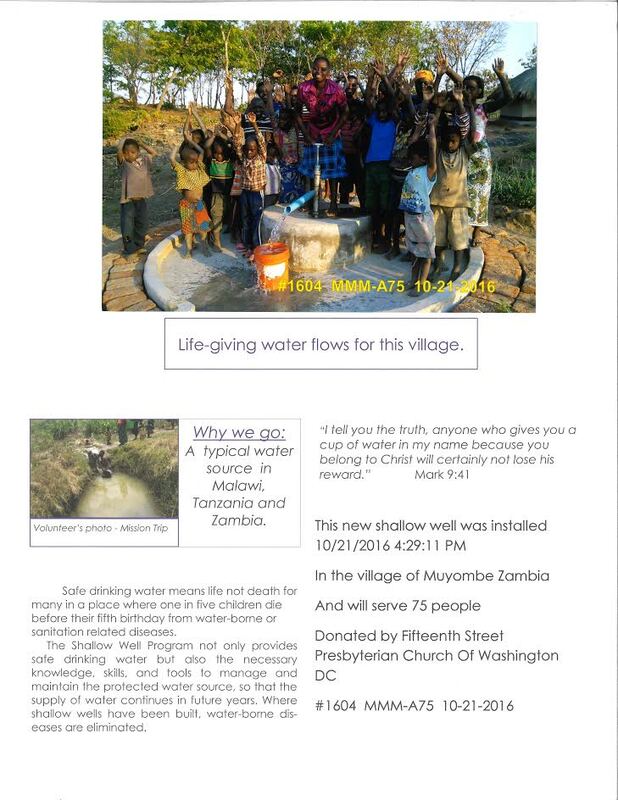 Consider joining the Zambia Clean Water Mission Committee by contacting us at info@15thStPresbyterian.org. We will be preparing interpretative materials and planning events to raise funds. We invite you to consider a gift today. Whether you can consider donating the funds for an entire well; (a one time $400 gift); or a gift of any size ($4, $40, $400) or any where in between will be greatly appreciate and you will be in essence providing "holy water". 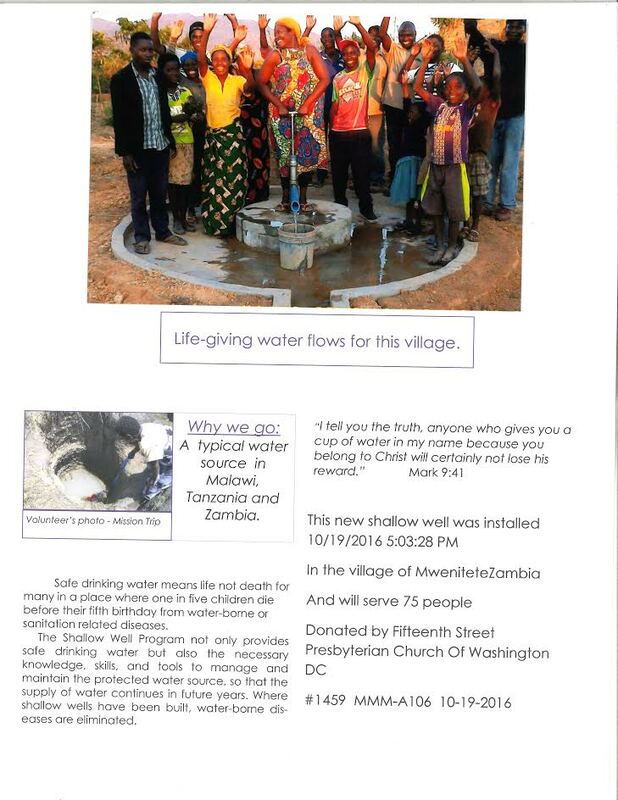 Water that will save a child's life in the name Christ. Thank you and God bless you and look for future announcements. Contact us with any questions and please - "Become Involved"!